These are some of the early review comments for Close to the Edge. They come from purchasers of the book rather than paid reviewers. Written in a wonderful style, this brings history to life. A kind of Horrible History style but much better. An excellent book. Lots of fascinating information, nicely told, and with illustrations. Historical, geographical and entertaining. Well worth owning. This is a lovely, readable collection of stories about the Holderness Coast. It’s not intended as a definitive history, rather a highly personal selection of fascinatingly quirky stories. This….. is a book about people in the landscape. It’s the stories of characters who are not all Gentlemen, or even men, but who lived for a long or short time, on the Holderness coast. I came to live on the Holderness coast more by accident than design. I had not planned to live on the East coast of Yorkshire, although the idea of coastal living always appealed. However driving along the coast road one day after a visit to a friend in Beverley, I stopped for petrol in a little village and noticed a signpost, ‘Viewpoint’. Curious, I followed the sign, parked my car in the clifftop car park and took a deep breath as I looked out over a huge grey-blue sea that transformed itself seamlessly into the sky so it was hard to know where one began and the other finished. I took a long walk on the beach below. Despite the late summer sunshine there were only a few fishermen and a couple of families packing up after a day out on the sands. The beach was like no other I’d ever seen. There was none of the usual briny scent in the air; there was neither seaweed nor rock pools, just a vast expanse of sand and cobbles. Large round globs of muddy clay peppered with pebbles littered the beach. They reminded me of the eggs in the creature’s nest in the film Alien. This was my first introduction to the realities of erosion. Later, after I bought a house in the village I began to explore the coastline, where my erosion education expanded as I found roads that dropped off the cliff edge, remains of buildings and structures unceremoniously tipped over onto the beach below and I learned of the villages that had ‘gone back to the sea’ – some that vanished centuries ago and some in living memory. All this fired my imagination. What was it like living on this coastline with this constant threat? What sort of people lived here and what did they do? How did they manage? Did the erosion concern them or was it something that they accepted as part of their life? So, with my friend and photographer June Berridge, a notebook and camera, we travelled the coastline looking, listening and learning about life at the edge. From our travels “Close to the Edge” emerged as an eclectic and sometimes irreverent collection of stories about people, places and events relating to this changing coast – chosen for no other reason than they tickled my imagination. I have looked at the past through modern eyes; subjectivity and opinion have crept in and my interpretation of attitudes, motives, behaviours and events provides only one of several possibilities. I hope the book transmits some of the affection I have developed for a part of England where no major event of national importance ever occurred – give or take a couple of landings on the shore by would-be kings who did not pause long to say hello to their future subjects – where the one constant is a hungry sea gnawing at the cliffs; where, over the centuries, people learned to adapt, to build their settlements anew or go under, and where a big sky suddenly shifts from grey, melancholy and brooding to glorious sunlight casting sparklers on the sea. 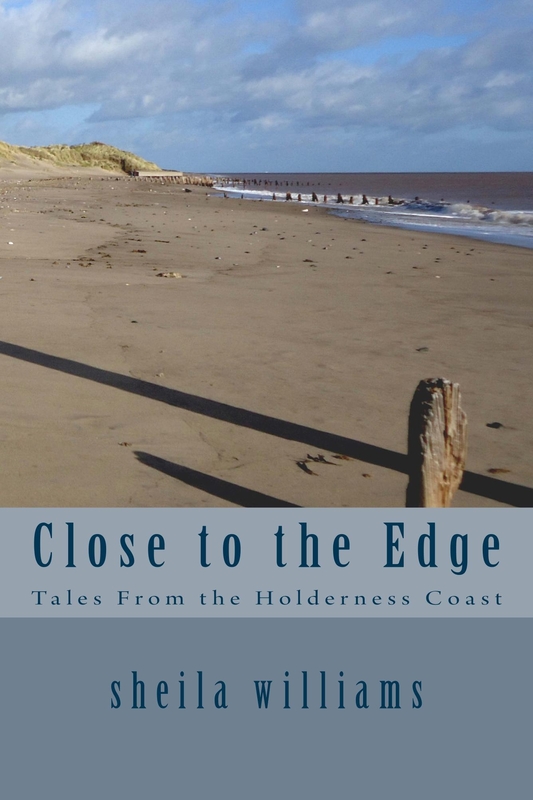 Close to the Edge – Tales from the Holderness Coast is available from Amazon in paperback and as an e-book for Kindle. What a lovely, lyrical description. I’m certainly tempted, both by the idea of your book and a desire to see this for myself. Hope things are successfully getting unraveled on the publication front. Thank you. It is a coastline worth a visit whilst it’s still there. I’ve given up on the ebook – I@m not at all happy with the photos so I’m busy formatting for Createspace. The photos are still a problem but I think I’ve now got to the root cause so hopefully it’ll be on its way later this month. Thanks for looking in.